Well, for those of you who don’t already know, or for those of you who doubted us… We did it! Jordan and I are officially “marathon finishers”. At least that’s what my shirt and medal say, anyway! 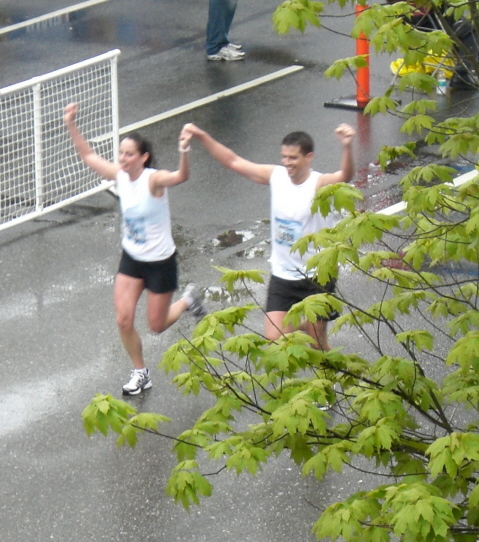 No, seriously, though, on Sunday, May 6th 2007, my brother Jordan and I ran our first ever marathon. The Vancouver International Marathon, to be exact. It was a long time coming, with our official training starting on January 2nd, to finally get to this euphoric moment. I have to say, running, and completing those 26.2 miles was one of the most satisfying accomplishments I’ve ever experienced. Maybe it was because I worked so hard to get there, and I never thought in a million years I would have run that distance; or maybe it’s because people thought I was crazy for even trying…. Something about crossing that finish line, almost made a tear come to my eye. In fact there were a few moments that made me pretty emotional on Sunday. And most of them were while I was running! When I saw my Mom standing on the corner going over the Dunsmuir Viaduct and she screamed “Aaaaahhhhh!!! !” because she was so shocked she actually got to see us, I was SO excited! Jord and I both immediately picked up our pace about 20%. At Mile 18, I was the one who was shocked, because my dearest friend, Diana, whom I’ve known since I was four years old, was there on Cornwall Avenue yelling “Go Janis! Go Behan’s!” and she gave me a high five. It was a critical time in the run, too. She was just the boost I needed to keep going. Then there was a point where a big group of us were running past a man doing the marathon walk that started and hour earlier than our run. He had artificial legs and braces on his arms to help him walk. Everyone started clapping, and yelling “Keep going, man!” as we ran past him. I just thought it was so awesome, that someone with all of those things against him from the start would even attempt to go that distance! It made me feel even better about what I was doing. Some people were dedicating their run to their Mom, or a friend that they lost, but I ran it totally for myself. It may be selfish, but that first marathon was all about me, and whether I could do it or not. And I’m extremely pleased with myself that I could complete my goal. And lastly, there wasn’t a better feeling than running down that last few hundred metres to BC Place with crowds of people cheering your name (it was written on our number bib), and seeing my parents and my sister-in-law Alex yelling the loudest over everyone for my brother and I. We crossed together hand-in-hand, feeling victorious. Until a few moments later, when the EXTREME pain set in…. and I’m not kidding. But no pain in the world could take away the feeling I have at this moment. Four solid months of training (usually four runs a week, with long ones on weekends) are about to culminate into the biggest physical challenge of our lives. Janis and I will run the full Vancouver Marathon on Sunday, the first time we’ve attempted such an insanely long distance. The Full Marathon course has been accurately measured by measurers qualified by AIMS, IAAF and Athletics Canada and has been certified by Athletics Canada as 42.195 km BC-2007-004-BDC and CAN-2007-002-BDC from IAAF. This means that we are very confident that, even considering the inherent errors and uncertainty in measuring a road race course, the course is at least 42.195 km. If you’re more of an Imperial system type, that translates to 26.2 miles. I’m a bit nervous, but I’m also pretty confident that we will finish without incident and perhaps even with a time that we are proud of. Either way, crossing the line on our own steam (ideally still running) and hopefully with huge smiles will feel terrific, and give us a sense of accomplishment. If you’ve ever wondered about training for a marathon yourself, we highly recommend the Novice Training Program from Hal Higdon. It’s 19 weeks of training that slowly builds over time, balancing stress and recovery so that your body builds strength as the distances get longer. For Vancouverites wanting to do the local marathon, just remember that this 19 week program means that your first day of training is roughly the day after New Years, it will be freezing cold and probably raining, and your New Year’s resolution has to last well into May. Hal is our official coach (in absentia) and any time we’ve had to reschedule or cancel a run I think of him, and how we’re letting HIM down. Hal has never heard of us before of course, but he’ll be getting a note of thanks if we cross that line alive. As will anyone who leaves us a comment of encouragement for us, either here on the blog, on Facebook, or in our email inboxes. We would also like to wish the best of luck to Ryan Ashton and Christine Behan, who will be running their first half-marathons on Sunday. Do the math: 21.5 km, or 13.1 miles. Until just a few weeks ago, I had never dreamed that I would run a distance that long, and they too have been training very hard for the big day. You are currently browsing the The Marathon Chronicles blog archives for May, 2007.